The FBA Chicago Chapter invites practitioners and students for an opportunity to enjoy lunch in a close setting with Judge Finnegan. 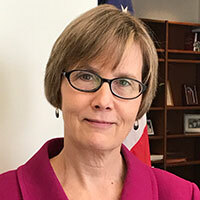 Sheila Finnegan is a United States Magistrate Judge for the Northern District of Illinois. After graduating from the University of Chicago Law School, Judge Finnegan served as a law clerk to the Honorable Milton Shadur. She then worked in the U.S. Attorney’s Office where she prosecuted federal criminal cases for a dozen years, and was appointed Chief of the Criminal Division. In 2000, she joined Mayer Brown, LLP as a litigation partner and served as co-chair of the Chicago Litigation practice. She remained at the firm until taking the bench in May 2010. Judge Finnegan is an Adjunct Professor of Trial Advocacy at Northwestern Law School and a Fellow of the American College of Trial Lawyers. She also formerly served as Co-Chair of the Seventh Circuit Electronic Discovery Pilot Program. Attorneys with active matters before Judge Finnegan should not attend this event.